NEWSFLASH: The folks at MiN New York have lost their minds!!!! They have rescinded the 10ml vial. everyone who has entered is still in, of course. For those of you just tuning in, be sure to go on FB and ‘like’ the Perfume Posse and MiN New York for a chance to win. After a Summer of near-Biblical heat (I’m not sure the Bible talks a lot about hot weather..but it does talk about Hell. July and August qualified.But after two months of Scorched Earth we are now in storybook Autumn temps: cool nights and early mornings (making waking up both a pleasure and a bit difficult….hard to crawl out from under the duvet. Yes, THE DUVET! Snuggly!). And those glorious blue skies. Leaves are still green but the asters and mums are blooming and the hummingbirds are fluffing up, prepping to head on out for warmer climes. I am famous for loving ambers and heavy-hitters in the extreme heat but in Autumn? ….. there is something so…….right..about leather scents in Autumn. It’s like that snazzy swing coat, in buttery-soft leather, that will feel like tissue paper in February. In these perfect Autumn Days, though, it makes me feel like a queen. I find myself reaching for leather flowers (Neil Morris Leather Garden), Arabian Leather (Parfums d’Empire Cuir Ottoman, though I still think this one works best in triple digits), slicey leather (Bandit, with that acidic/acerbic lemon. Like sitting in a private train car with the most impossibly chic woman – friend? enemy? frenemy? you don’t know – you only know you want to be Just Like Her, with her mean self. But you know you never will…..then you look across the table…and you are REALLY taken with her sensuous, lynxlike cousin, Maitre Parfumeur et Gantier Cuir Fetiche. She takes ‘aspirational’ to 11, in that way a Frenchwoman can make a white cotton shirt look like…..I don’t know..a Dior ballgown? This perfume reminds me of a Parisienne friend of my then-neighbor in Chicago; she was of ‘average’ looks, wore jeans and a sweater. Yet no one could take their eyes off her, she was just so polished and chic. Cuir Fetiche is like that, for me. I raved about this scent awhile back in this post. My love for it hasn’t changed one iota. I still think it’s one of the most sensual perfumes around and only wish I could rock those leather opera gloves once again. And maybe the red leather bustier. But for now I’ll aim for the gloves. Now. You’re probably thinking ‘umm, Musette? Honey? You ALREADY reviewed this! We KNOW you love it. Hon, maybe you need to take your meds?!”. Yeah, yeah – meds in a minute. But what you don’t know, my darlings, is that the lovely Mindy Yang, of MiN New York, has decided to share a little of the Cuir Fetiche leather love with the Posse! It’s a 10ml vial (and let me just tell you how unhappy I am that I cannot enter this contest!). To enter all you have to do is go on Facebook and ‘like’ both Perfume Posse and MiN New York and we’d love it if you would leave a little comment! If you are not a Facebook user, that’s okay – We are not haters, no sirree! Just leave a comment here: what’s your favorite leather? (if you hate ’em ALL? say so!) . (I put the clickety-links in for you so all the heavy lifting’s done!). Heck, I’d dance the Mamooshka for 10ml of Cuir Fetiche. I am jealous. The winner will receive the fabulous juice from MiN New York so you need to be okay with me giving them your name/address. Did I mention I am jealous? Whoever wins this had better lace up a bustier in my honor – that goes for you guys, too. If Mario can do it, so can you! (and as weird as this is going to sound, he looks sort of……fabulous! This is from a Nip/Tuck episode. I never saw the show but…don’tcha just wonder what they nipped/tucked? Yikes!!!!! Favorite leather-err that’s hard. If I had to choose one, it would be PG Cuir d’Iris. Or Chanel Cuir d’Rusie, or Dior Homme before they ruined it, or Knize Ten or Dzing! or vintage Cabochard parfum or my old faithful Azuree. I haven’t tried a lot of leather yet, but it’s a note I’m really interested in right now. I like Cuir de Russie, Bottega Veneta, and Dzing! Oddly enough, my recent interest in leather was sparked by a candle: Warm Perique Tabac by Voluspa. It’s tobacco and leather, and I love it. The wax is coconut-based and soft, so I have taken a bit of it and worn it like a solid perfume. It totally worked.. didn’t feel weird on my skin or anything. Probably should’ve mentioned.. I liked Perfume Posse and MiN New York on Facebook, so I would like to be in the draw. There are several leathers on my to-try list: Daim Blond, Cuir Mauresque, Tabac Blond, Knize Ten, and now probably Cuir de Lancome too since I keep seeing it mentioned. I’m also waiting for Thierry Mugler’s leather line to come out this fall. I’m curious what leather Angel and Alien will smell like. Musette, you are fab both on and off the meds! I am lurving leather and have just discovered Leather Garden – it is utterly sexay. Need to explore more Neil Morris, urgently. Still loving my Whips and Roses, though I think the melancholiness will really sing in the first days of winter, as the earth begins to fade to sleep for winter. Azuree and Bandit, of course, though of late I feel too chubby to wear the Bandit -it is definitely a ‘slim’ frag for me! Cuir Fetiche is now firmly on the radar. Love leather, Facebook, not so much. The two I have that come to mind are Habanita and Whips and Roses. I tried Bottega Veneta and I must be anosmic to it because I can’t smell a thing there. Would love to try this one. Thanks. I liked bouth on the FB. I’m the leather lover, my favourite is Cuir Ottoman by Parfum d’Empire. Oh, leather is my favorite! I’m currently obsessed with it. I really love Bandit, but I don’t think I have enough leather in my “wardrobe.” I liked MiN New York and the Posse both on Facebook- I would just love to win this! Thanks Musette, and thanks to Mindy Yang as well..
Couldn’t find a “like” button on The Posse’s FB page, so I figure I’d better comment here. My favorite leather is Jolie Madame. Violet-scented gloves of the very finest leather. I don’t think I’ve tried any leather perfumes, and you make this one sound wonderful- please enter me in the draw. I “liked” both Perfume Posse & MiN, but MiN turned down my efforts to register. It looked like a great site, so I will try again when I am not headed out the door! Howdy, sweet M! I’ve been coming around to leather in the past year or so and my faves are your Cuir Fetiche, Bottega Veneta, Daim Blond and Jolie Madame. Getting brave enough to want to try Cuir de Russe again as well. Thanks for a fun post! Oops, I forgot all about the oh-so lovely Cuir de Lancome!! Hallo my dear – yes, this is my favorite time of the year bcs of just the weather you so eloquently described! Ahhh. I love early autumn leathers too. Cuir Ottoman, Cuir de Lancome, Histoire l’Eau Mauboussin (a cheapie that smells like the best potpourri with a leather base, yum). I’d love to try the Cuir Fetiche. I will like you guys on FB but my name there is Marina Slevenski (long story). The email address is the same. Thanks to all for the opportunity! Leather of all leathers for me – Cuir de Lancome, followed by Cuir de Russie. I tried a tiny bit of Cuir Fetiche and do believe that would join the top two other should I win. Thanks so much for the draw, and good look all!! Hey, I totally agree about leather and the fall. Just busted out my Cuir Mauresque yesterday. I also love Cuir Ottoman, Lonestar Memories, and Knize Ten. Cuir Beluga is my favorite, followed by vintage Jolie Madame. Thank you for the draw!! I would love to enter the drawing–thanks! My favorite leather scents are Cuir Mauresque, Tabac Blond and Cuir de Russie. Would love to enter the drawing. Cuir Beluga, Cuir Mauresque, Boxeuese and Traversee du Bosphore are my faves so far. Bandit is my favourite leather…but I am open to a new more dangerous leather! I have not tired many leathers, but I think from your description that I’d love Cuir Fetishe (cool name). I did try (vintage) Miss Dior…would that qualify as a leather..loved that! I have yet to try the new Miss Dior. I love this time of year, too. Time to break out the leather blazers and leather booties! Great article. Thanks for the draw. I do love me some Jolie Madame and Cabochard. 🙂 Thanks very much for the draw. I would love to enter the drawing, thank you! My favorite leathers are Bottega Veneta and Cuir Beluga. Mine has to be Cuir Lancome. Love it !! Thank you for the draw!! 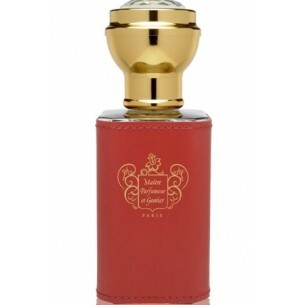 Mommy loves CUIR et CHAMPIGNON by DSH perfumes. It’s a Spanking good leather, not sweet, muy masculine! My only wish was the names of her perfumes were not beyond my vocabulary!!! My favorite leather is without a doubt Cuir de Lancome. It might be my favorite perfume of all time! But there are others I love — the drydown of Cuir Mauresque is smashing, and recently I’ve fallen for the super-smooth Midnight in Paris. I am not on Facebook, but I just subscribed to the MiN newsletter — does that qualify me? Thanks for the draw! I just checked the notes for Curi Fetiche on MIN and this sounds sweetly and leathery delicious. I’d love to be in the draw. Favorite leather…I love so many of them! Lanvin Scandal, Cuir de Lancome, Diorling, that Tom Ford one (oh & the suede one, too), Gres Cabochard, Tabac Blond, & haven’t done enough sniffing of this yet, but Byredo Bullion is probably gonna be on the list. Cuir de Lancôme! Thanks for the draw! My favorite leathers are Dzing and Lonestar Memories.thanks for the draw! Love the leather smell coming from profumo Oud Caravan version No. 1. A combination of Oud oil and other spices evoking the smell of time immemorial of desert caravans laden with spices, frankincense and leather goods. Lone Star Memories layered with Dirty English. Mona di Orio’s Les Nombres d’Or Cuir has a special place in my heart, but I like the carnival fun of Dzing! too. Haven’t tried many leathers. I do like Cuir de Russie and Lonestar Memories. Like Poodle I could not smell a thing in Bottega Venetta. I like my leather suede-like and soft, so I think my favorite is probably Cuir Beluga, with Daim Blond in second place. Thanks for the drawing! Thanks for the links. Just starting to love leather myself and have been enjoying as many samples as I can sneak from nordstroms of Bottega Venetta. I’d love to experiement more! I have some vintage Habanita that is just killer. I love the scent of leather so I would really love to try more leather perfumes. Thanks for the draw. My leather loves are suedes, Bottega Veneta and Daim Blond. Both apricot suedes which are perfect with my uber fine pale dove suede biker jacket. In fact I wear them to make me feel I’m wearing this wholly inappropriate garment as the occasions when the weather is cool enough, but not cold and not raining mean it only gets an nnual outing. The scents get worn far more often. Gorgeous giveaway, thank you to PP and MiN. I would love 10 mls of Cuir Fetiche! I love leather!! My number one favorite is Bandit, followed by Cuir Ottoman, Cuir de Lancome, Bottega Veneta and Kelly Caleche. Would really like to try this one as well! Cuir de Ottoman is my favorite, closely followed by Dior Bois d’Argent. I have been very interested to try this! …Onda (extrait) is my favorite leather. Thanks for the draw!! Tabac Blond is my favorite leather, but I also go for Cuir de Lancome! Musette, you are adorable! Oh my, what a great prize, I would love to be entered! I adore Jolie Madame both old and new, and vintage Cabochard was hard to beat in the leather department. Also hoping to get the original Trussardi by Trussardi soon, the one in the white “leather” bottle – it is amazingly good! I love the MPG line but I have never tried this one, it sounds great! My favorite leathers are Cuir de Lancome and PdE Cuir Ottoman. Thanks to both of you for the draw. Cuir de Lancome! In fact, I am wearing it today! SL Cuir Mauresque and Mona di Orio’s Cuir are my favourite leathers right now, both wonderful! I have not tried many leathers but my favorite so far is Idole de Lubin. When I first sampled it, I was infatuated…so powerfully composed. Rum and leather, what a great combination! But I have not finished my sample, as much as I love it. I really have to be in just the right mood to wear it, it speaks to a more aggressive mood. I think I will wear it again when the weather gets crisp…a leather for crisp autumnal weather could be perfect! I.just.can’t.do.Facebook — so I’ll have to pass on the draw (sob! ), but I do love leather! I start my favorites list with Azuree and just keep going… I’m wearing Cuir de Lancome today — it’s perfect, as usual! Love Cuir Beluga & Cuir de Russie Parfum. Thank you! add a powdery orris heart and beautiful iridescent aldehydes top notes. It really is a beauty and won my heart over previous leather loves Cuir de Lancome, Bottega Veneta and Knize ten. Never tried Cuir Fétiche, though…who knows… it might be my next crush! I ‘like’ both perfume posse and MiN on fb..
My fave leather is probably Prada Cuir Ambre..oh actually if Puredistance M counts as a leather perfume then that one’s probably my FAVE!! haven’t tried this so would LOVE to be entered in the draw! The leathers I love and own are: PG’s Cuir Venenum & Cuir Santalion; Heeley’s Cuir Plein Fleur; Lancôme’s Cuir; Montale’s Aoud Cuir d’Arabie; Esteban’s Cuir; Idole de Lubin; L’Artisan’s Dzing, Dzongkha, and Traversee du Bosphore. ..and Tauer’s Lonestar Memories and Vero Profumo’s Onda. I haven’t tried Cuir Fetiche, though I’d love to! And I already ‘like’ both Perfume Posse & MiN New York. I haven’t tried many leathers, wasn’t sure I liked them until I tried Bottega Venetta *love* Even more surprising DH loved it on me. Am on FB and liked both, thanks! I haven’t tried much in the leather family. I don’t know why but it intimidates me just a little, maybe because I’m not sure where to start. However, this one sounds like a wonderful one to start with. I’d love to try it. Since I hate FB, can you enter me in the draw? Thanks!!! What an awesome contest and prize! Since it is cooler where I live, I’m gonna have to drag out my Cuir de Russie (Chanel) and Amouage Memior. I cannot wait until the leaves start turning and I start to wear Sycomore. I have about 20 favorite leathers – Hermes Bel Ami, Chanel CdR, PdE Cuir Ottoman, SL Daim Blond, Bottega Venetta, Pacal Morabito Or, Etro Gomma, Heeley’s Cuir Pleine Fleur, and of course MPG’s Cuir Fetiche. Thank you for the giveaway! Hey! Interesting draw! 😀 I got 1697 by Frapin last Xmas! Some call it a leather (to me it’s more just an amber), it is so lovely and boozy and sweet! Then there’s Tabac by La Via Del Profumo/AbdesSalaam Attar that just makes me think so intensly of horses and horse riding and all things horse related, therefore leather! I love it and might get my loved ones to offer it to me for next Xmas! It’s the only too I can think of! My favorite leather is Cuir Venenum by Parfumerie Generale. Wowza! What an offer from those sweeties and MiN. Thanks to them and to you. MPG has some fantastic perfumes. My fave leather is probably that insanely animalic Vierges et Toreros by ELdo. I find leather a hard note to like, but Cuir Ambre from the Prada Exclusive collection is quite fab! I haven’t tested a lot of leather scents though, maybe that will be my next fragrant project? My favoriteis Chanel Cuir de Russie, but there aren’t many leathers that I don’t like. Thanks for the draw! What a lovely offer! Please enter me in the draw, as I love leather fragrances. Some of my favorites are vintage Bandit, Jolie Madame, and Cabochard. Other frequent fliers are Chanel Cuir de Russie (extrait), Cuir de Lancôme, and Tabac Blond. My favorite leather is Bandit. Have really wanted to try this one! Am I entered in the draw? definitely Tuscan Leather, the in-your-face kind of leather. Then throw in a tad bit of berry to make it delicious. yummy !!!! Wowser! My favorite leathers: vintage Habanita in extrait, vintage Cabochard & vintage Jolie Madame. Cuir de Russie and Bandit are quite good also. Can you tell I like leathers? Still in the experimental sniffing phase, but Bottega Venata is a FBW fave and in heavy rotation. I am the only human being on the planet that is not yet on Facebook, but I’d still love to try Cuir Fetiche. Please enter me in the drawing! Favorite leather of all time: DSH Erotica edp. I’ve seen all my vintage faves mentioned already so I’ll add Kelly Caleche! Oh, thank you for offering a non-Facebook means of entering this! :Happy-Grin: For years I tried to keep up with every new social media trend, but once Facebook/Twitter/Pinterest all rolled around, I was so burned out I still can’t convince myself to sign up for accounts. My favorite leather is Bandit, which I have loved for years. Thank you. I absolutely adore Cuir de Lancome. It’s my number one all-around favourite fragrance. I’m eager to try more leathers, and this one sounds fantastic! I like leather in moderate spray of Agent Provocateur. Thank you for the draw! This one has me in a tizzy cause I just can’t afford it right now! Love me some Jolie Madame extrait! My have leather scent of the moment is Dzing! In fact, wearing my sample today I was just searching for a used bottle on the web and considering buying a 50ml one…love, love, love. Fall is just made for a nice leather! I love leather and inscence with some vanilla thrown in….right now I am Chanel Cuir de Russie, but I am in love with many leathers, although there are some I have to turn my nose up at. Thanks for the drawing!!!!! Full of excitement here….and by all means I would wear the corset!!!! Azuree! It’s almost fresh. Lot a hot sports car in the summer! Didn’t see a winner on this one,yet! still hoping! Teehee. Love leather.